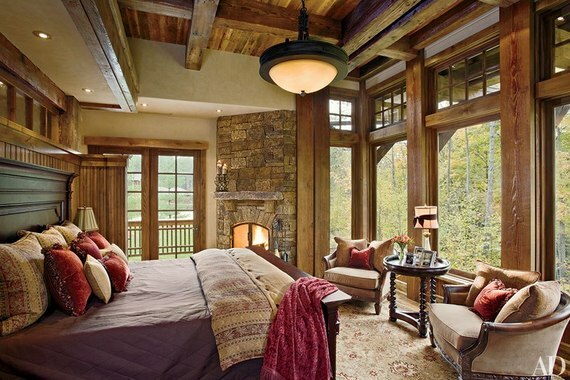 In the master bedroom of a Thom Filicia-decorated upstate New York getaway, a twig chandelier hangs above a custom-made Murray’s Iron Works four-poster; the curtains are of a Groundworks wool, the étagères are by Mecox, and the rug is from Safavieh’s Thom Filicia Home Collection. 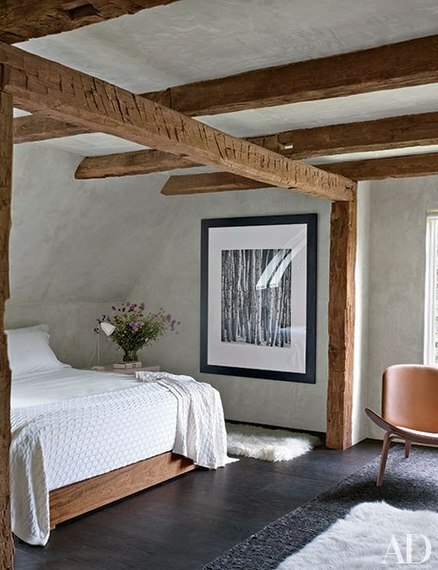 A vintage photograph, a gift from actor Hugh Jackman, hangs near the De La Espada bed in the New Paltz, New York, residence of filmmaker Shawn Levy and his family, which was renovated by Bonetti/Kozerski Studio. 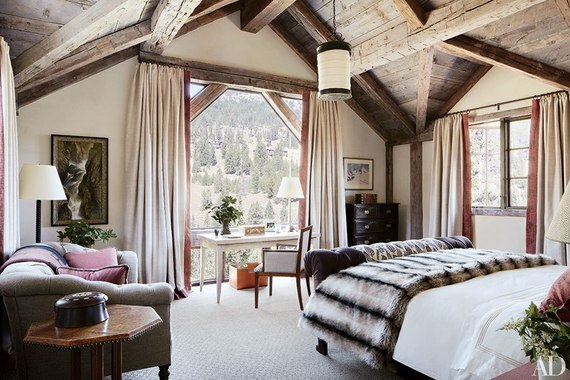 A Jasper bed and chair and a Sultanabad carpet furnish a guest room of a Big Sky, Montana, stone-and-timber house designed by Locati Architects and decorated by Michael S. Smith. The lamps were fashioned from Han-dynasty vases, and the bed linens are by Nancy Koltes. 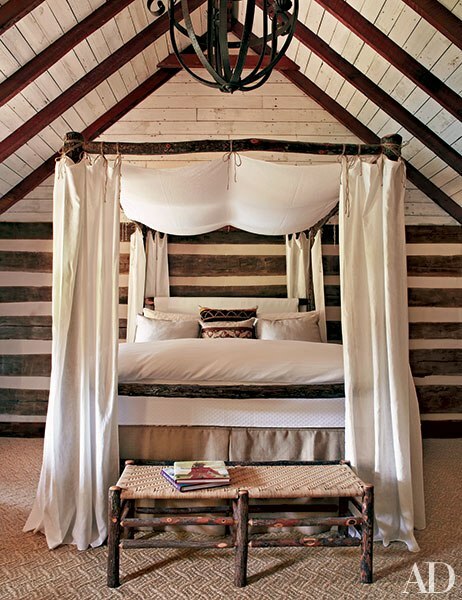 The master bedroom of this historic farmhouse in France’s Loire Valley features a canopy with a Brunschwig & Fils fringed burlap. Parisian interior designer Jean-Louis Deniot worked with his sister and business partner, Virginie Deniot, to completely overhaul the home. 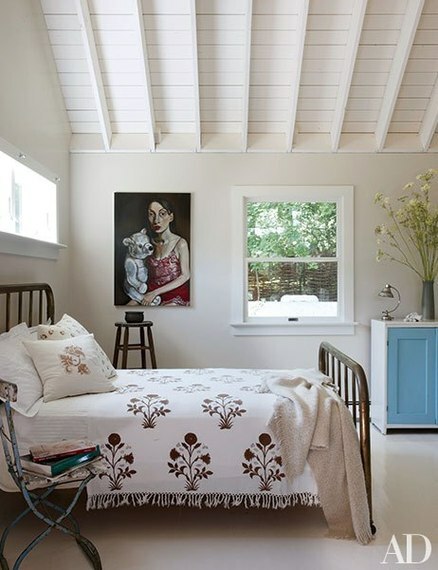 A bedroom in Anh Duong’s East Hampton, New York, house includes an antique bed and a self-portrait of the artist. The home is a onetime fisherman’s cottage that Duong renovated with architect Daniel Romualdez. At Jane Fonda’s Forked Lightning Ranch in New Mexico, the guesthouse’s lit de sorcière has convex mirrors that are meant to ward off evil. The bedding is vintage, the antique table is pine, and the American hooked rug features a grape motif. The master bedroom of this Big Sky, Montana, home features a pendant light by Vaughan and a 1940s French writing table and chair from James Sansum Fine and Decorative Art; the bed linens are by Pratesi, the throw is faux chinchilla, and the carpet is by Thomas Jayne for Stark. The residence was designed by JLF & Assoc. and decorated by Markham Roberts. 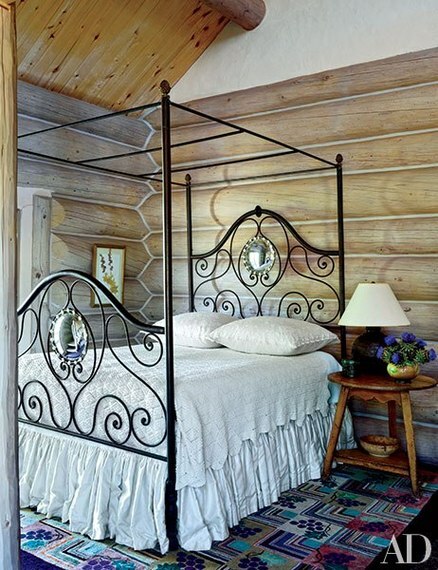 Tadpole Cottage, a two-room guest house in Tennessee’s Great Smoky Mountains, includes a bedroom whose walls and ceiling inspired the high-contrast palette of the furnishings, including the cream bed hangings for the hickory-log four-poster. 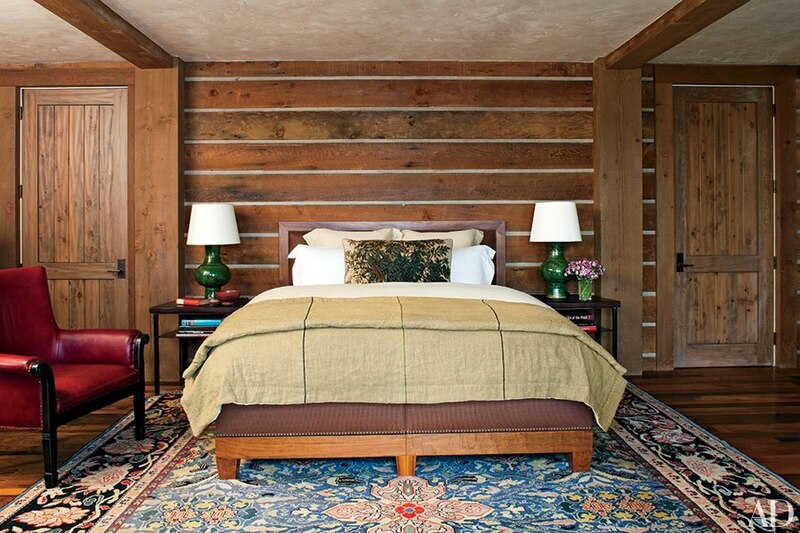 This Montana family retreat by Lake|Flato Architects and interior designer Madeline Stuart features a master suite with a custom-made platform bed and a woven-leather headboard; the carpet is a pieced cowhide from Lawson-Fenning.